The night begins at 6.30pm with the 'Safety In Numbers' workshop where people of all levels of ability learn a few bluegrass songs together and perform them at the beginning of the concert at 7.30pm. The songs include instrumental backing and breaks, but you don't have to play an instrument to be part of the SINners group. At 7.30pm an open mic bluegrass & old timey concert gets underway with totally unplugged all-acoustic music and it continues till late. This final wind-concert for the year is always extra fun with everyone lined up to wait their turn to be on stage. 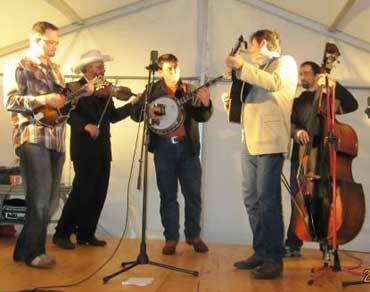 Of course, being bluegrass music, there is jamming all night - they just never stop playing! The whole night takes place through the efforts of dedicated volunteers, including the performers. We stop for a special supper (contributions welcome). Soft drinks are on sale throughout the night, tea & coffee are free. Entry cost is $5 for members of the Bluegrass & Traditional Country Music Society of Australia (BTCMSA), $7 others. All are welcome! Kids under 18 are free. For more information, call Rod Jones on (02) 9456 1090 or check out the Facebook page.